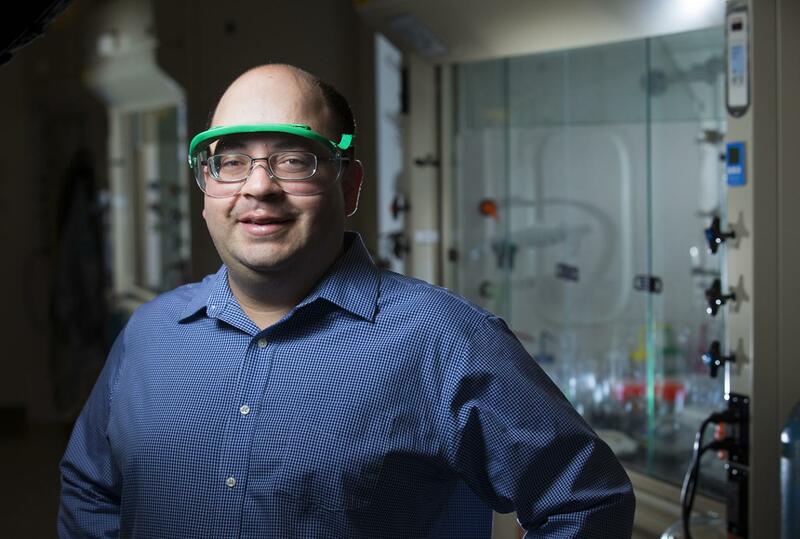 AMES, Iowa – One of the problems for Javier Vela and the chemists in his Iowa State University research group was that a toxic material worked so well in solar cells. What materials could produce semiconductors that worked just as well, but were safe and abundant and inexpensive to manufacture? "Semiconductors are everywhere, right?" Vela said. "They're in our computers and our cell phones. They're usually in high-end, high-value products. While semiconductors may not contain rare materials, many are toxic or very expensive." Vela, an Iowa State associate professor of chemistry and an associate of the U.S. Department of Energy's Ames Laboratory, directs a lab that specializes in developing new, nanostructured materials. While thinking about the problem of lead in solar cells, he found a conference presentation by Massachusetts Institute of Technology researchers that suggested possible substitutes for perovskites in semiconductors. Vela and Iowa State graduate students Bryan Rosales and Miles White decided to focus on sodium-based alternatives and started an 18-month search for a new kind of semiconductor. The work was supported by Vela's five-year, $786,017 CAREER grant from the National Science Foundation. CAREER grants are the foundation's most prestigious awards for early career faculty. They came up with a compound that features sodium, which is cheap and abundant; bismuth, which is relatively scarce but is overproduced during the mining of other metals and is cheap; and sulfur, the fifth most common element on Earth. The researchers report their discovery in a paper recently published online by the Journal of the American Chemical Society. The paper's subtitle is a good summary of their work: "Toward Earth-Abundant, Biocompatible Semiconductors." "Our synthesis unlocks a new class of low-cost and environmentally friendly ternary (three-part) semiconductors that show properties of interest for applications in energy conversion," the chemists wrote in their paper. In fact, Rosales is working to create solar cells that use the new semiconducting material. Vela said variations in synthesis – changing reaction temperature and time, choice of metal ion precursors, adding certain ligands – allows the chemists to control the material's structure and the size of its nanocrystals. And that allows researchers to change and fine tune the material's properties. Several of the material's properties are already ideal for solar cells: The material's band gap – the amount of energy required for a light particle to knock an electron loose – is ideal for solar cells. The material, unlike other materials used in solar cells, is also stable when exposed to air and water. So, the chemists think they have a material that will work well in solar cells, but without the toxicity, scarcity or costs. "We believe the experimental and computational results reported here," they wrote in their paper, "will help advance the fundamental study and exploration of these and similar materials for energy conversion devices."